Mount Rainier, from the Northeast. The largest glacier in the 48 states, the Emmons Glacier, flows nearly 10,000 vertical feet from the summit to the rock and dirt-covered terminus shown at lower right in this photo. This exciting route is often overlooked in favor of the "standard" route on the other side of the mountain. It offers everything that a big mountain has to offer: a beautiful forest on the approach gives way to alpine meadows, a small glacier, and the massive Emmons Glacier leading to the summit of this Northwest icon: Mt. Rainier. Climbers on this route must be in good condtion and they must carry and know how to use crevasse rescue equipment and navigation tools sufficient to find their way in conditions of total whiteout. Most parties climb the route in two days, with a single high camp at approximately 9,500 feet. Behold the snafflehound. Beware. These guys will chew your pack, eat your boots, and steel your food. Do not trust them. Mount Rainier towers above the surrounding Cascade Mountains. As a result, the mountain can generate its own weather and even during stable periods it is generally foolish to climb the mountain without carrying storm clothing and complete bivouac gear. Even when well-equipped, it is a poor plan to set out in a period of expected poor weather; check the latest weather forecast. The route starts at the White River Campground, at 4200 feet in the Northeast corner of Mount Rainier National Park. This campground lies about ___ miles from the city of Tacoma, Washinton, via highway 410 out or Enumclaw, and the Sunrise Road turnoff ___ miles inside the park boundary. Climbers en route to the mountain must sign in at the White River entrance station. Camping on the route is limited to designated campsites with specific quotas and permits are required, so advance registration is recommended - particularly for any weekend climb. In addition, an annual climbing permit is also required. 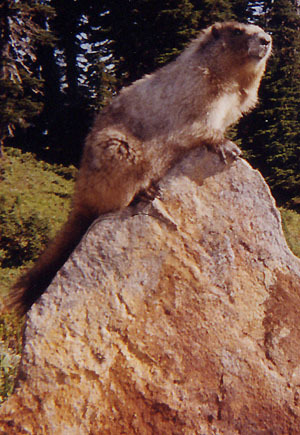 Contact Mount Rainier National Park for details. The first three miles of relatively flat trail pass through shady forest, with occasional glimpses of the mountain. As the trail starts to climb, the forest gives way to meadow and, at about 3.1 miles, good camping is found in Glacier Basin (6,500 feet). Beyond here, the trail becomes rougher and starts to climb steadily, and meadows give way to talus. At 7,500 feet, the first bit of glacier is encountered, the Interglacier. The view Southeast accross the Emmons Glacier from near "The Prow," above Camp Schurman. 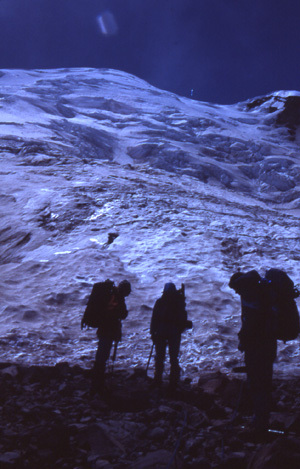 Note the climbers in the foreground, on what is described as "option 2" for the route from Camp Curtis to Camp Schurman. Many climbers do not rope up for the Interglacier, but there are crevasses on it and appropriate care should be taken. The best route usually starts up the right side, and then diagonals leftward to the rocky ridge on the left skyline, near "Camp Curtis," at about 8,500 feet. (2) drop diagonally down and SE from Camp Curtis to gain the edge of the Emmons Glacier (take care for a moat and some very large crevassees), and head up the glacier to Camp Schurman. A pre-dawn start at Camp Schurman. Some parties camp at Camp Curtis, but the traditional "first choice" is Camp Schurman (9,450 feet). At Camp Schurman, there are a few campsites on dry rock, but most are on the glacier nearby. Be careful to probe around your prospective tent site so you don't wake up in a crevasse. Take care wandering around camp and secure all you gear so it doesn't roll or blow away, causing you to have to head down the glacier after it. 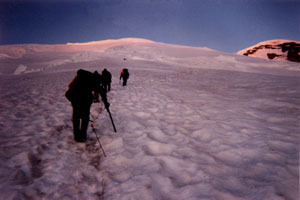 Another alternate to camping at Camp Schurman is to camp about 500 feet higher, at the Emmons Glacier Flats. There is no dry land to sit on up at the Flats, and it is probably even more critical to check the area for hidden crevasses when camping at the Flats than it is at Camp Schurman. The choice of campsites often comes down to which is available under the NPS permit system. Many parties depart Camp Schurman as early as midnight or 1:00 a.m. The plan is to get up and back down to camp before the sun warms up the snow and causes crampons to ball up, and this is a good plan. Strong parties, however, do not need to get up quite so early. However you handle this decision, the key is to take time to rest and drink plenty of fluids and eat as much as you can at your high camp. An early arrival the day before is a very big plus on summit day. The upper part of the mountain, showing Camp Schrman (with yellow tents in the foreground) and Emmons Flats (with a less prominent cluster of tents visible at lower middle). The route appears ad footstps in the sun, leading to "The Corridor." On the upper part of the mountain, above Camp Schurman, the route can vary a great deal from year to year and during a single season. The snow surface will be greatly affected by current weather conditions, but the route followed also changes constantly so that, in planning their trip or upon arrival at Camp Schurman, climbers may wish to consult with the rangers about the route and surface conditions. 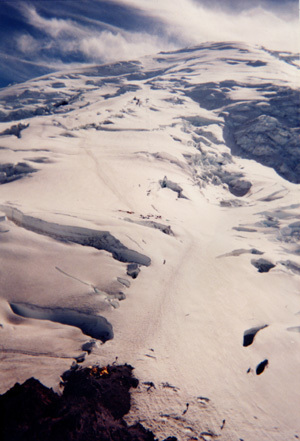 Advance "updates" may be obtained over the telephone, or through an inquiry on cascadeclimbers.com, and climbing rangers are usually "in residence" at Camp Schurman during the main part of the season. The route above Camp Schurman generally starts out with relatively straight forward travel up gentle slopes for over a thousand feet. The route trends left into what is called "The Corridor," usually a relatively crevasse-free ramp approximately 1,500 feet high. Towards the top of this feature, the climbing steepens considerably. Early morning on the Emmons Glacier route. Climbers should realize that conditions usually grow icier as one climbs higher on the mountain. At the first sign of any need for crampons, you should put them on in order to avoid finding that you need them as you are clinging to your ice axe on a steep slope, above a yawning crevasse. High on the Emmons Glacier route. At approximately 12,500 to 13,000 feet, climbers are usually forced to choose whether they are going to detour left or right around a large bergschrund above the top of the corridor. Generally, it is more efficient to head right until the bergschrund presents too much of an obstacle (usually sometime after the middle of the season). If you do take the left-hand option, take careful note of where it occurs if you join the Standard route -- Emmons Glacier Route climbers have often missed their turn when heading back down. Looking down from 13,500 feet. The glacier tongue is nearly 10,000 feet below, and the top of The Prow, and the site of Camp Schurman, is visitle at center left in this view. Below that, appearing as a wedge-shaped patch of snow in this picture is the Interglacier, and the valley of the White River trails out into the distance. The slope angle reaches a maximum steepness of a little over 35 degrees before easing off as the summit rim comes into sight. At this point, however, the elevation seems to really start to take its toll; it is not uncommon for parties to stash one or more of their members in a sleeping bag (bring an insulating pad as well) while they continue on their climb. Be very cautious about doing this. These "castaways" will be alone and more often than not they are the less experienced members of any team. They may feel better after a half hour's rest and start to crawl upward again (unroped) and, on their own, they may be in serious trouble if they are suffering one of the more dangerous forms of alitude illness or if the weather turns bad. Indeed, the long uphill trudge can seem to go on for hours after you spot the crater rim. Keep on trucking, though, and you will eventually arrive. One advantage of the Emmons Glacier route over the Standard route is that, if the right option is taken during the ascent, the route "tops out" much closer to the true summit and you do not have to crawl accross the summit crater to reach the top. The true summit is on the Northwest corner of the crater, a few hundred feet above what is termed "register rock," where you can sign your name in "the book." On a clear day, you can see mountains in Oregon and Canada; it is almost like standing on top of a map of the Pacific Northwest. The summit crater, clearly visible on the map shown below, offers some shelter from the wind and can be quite warm even on a relatively cool day. There are an interesting collection of steam vents around the rim, and shelter may be gained in the ice caves beneath the summit crater snowfield in an emergency. Note: at the summit of Mount Rainier, you are a very long way from home. Be prepared for a long descent, and be careful!